UnsungHipHop.Com: What Does President Obama, HipHop Music, Culture and Politics Have In Common? What Does President Obama, HipHop Music, Culture and Politics Have In Common? RapHead.com - Some consider it a catch 22 that hip hops most elite rappers are promoting President Barack Obama via song, video, or concert. Some would argue the fact that its a bad look for Barack Obama's image and campaign to the public. In my personal opinion I think that rappers are the most influential motivators for young adults across the country. Its no secret why when the powers that be want to make a come up they recruit the power players in rap music. Ciroc needs to boost sales they grab, P.Diddy- CHA CHING! Barack Obama needs to boost votes, he grabs Jay-z, P.Diddy, Common and others - KING ME! The followers of these mega rap superstars are votes that NO PRESIDENTIAL CANDIDATE HAS EVER GOTTEN BEFORE! Prior to Barack Obama taking his seat in the White House, Rappers cared less about showing their allegiance. Now you have the video's of hit records reppin' that United States Flag like it was the logo of the record label. Back in the 90's this flag would have had a ridiculously huge tank, marijuana leaf, or some other record labels logo. In 2012 with Barack Obama in the White House, we get a United States Flag! United States Hip Hop! United States President Barack Obama has also given Hip Hop Swag! Tell me the last time it was cool to put the President of the United States on your shoes, tee shirts, hats, sunglasses, key chains, or pimp cups!?! NEVER! Because Barack Obama is the first President of African American decent its "Cool" to rep him in politics as well as Hip Hop Music and Culture! 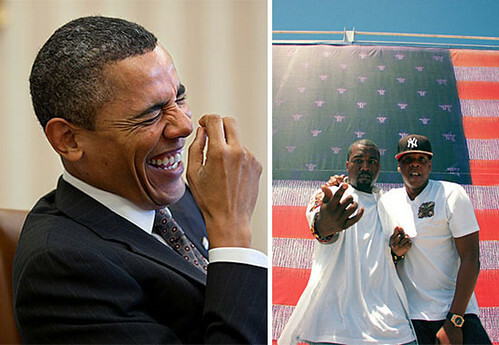 On top of all that we found out President Barack Obama is a RapHead! How ya love that!!! Now all we have to do is get him to join officially. as well as other state and local offices. Make sure your heard by registering to VOTE!